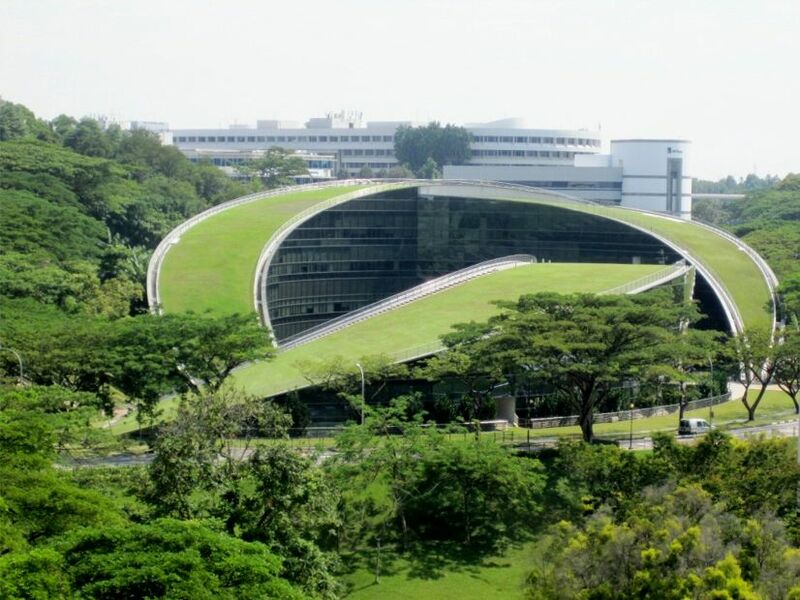 Nanyang Technological University (NTU) has earned itself a reputation as one of the leading science, technology and research universities in the world. The university's main 200-hectare Yunnan Garden campus, situated on the southwestern outskirts of Singapore, houses Singapore's largest on-campus residence infrastructure including 16 halls of residence for undergraduates and a graduate hall. NTU was the Olympic Village for the first-ever Youth Olympic Games in 2010. Its mission is to nurture creative and entrepreneurial leaders through a broad education in diverse disciplines. The 215,000-square-foot School of Art, Design and Media (ADM) is the island nation's first professional art school, and the refurbished ADM Gallery is a unique, high-tech creative space in Singapore. Fitted with museum track lighting and climate-controls to safely present sensitive and valuable works of arts, the Gallery meets today high international museum standards and hosts exciting contemporary art exhibitions by artists from Singapore, Southeast Asia, and beyond. Varying from 2-5 stories, the key feature of the building design is the green roof that slopes almost at a 45-degree angle. Formed by two sloping, tapering arcs that interlock with a third, smaller arc, the roof of the School of Art, Design, and Media was cast in heavily ribbed, reinforced concrete. The sunken, almond shaped courtyard is formed by the space in between the building two main arms and is beautifully reflected from the interior high performance, double glazed glass curtain wall facades. Accentuated by fountains and a "floating" performance platform, a reflecting pond adds to the communal ambiance while helping to cool the center space. "Completed in July 2006 at a cost of $38 million, it was officially opened in April 2009. Today, it is regarded as an icon of sophisticated design and architecture, and has been featured in various international design publications. 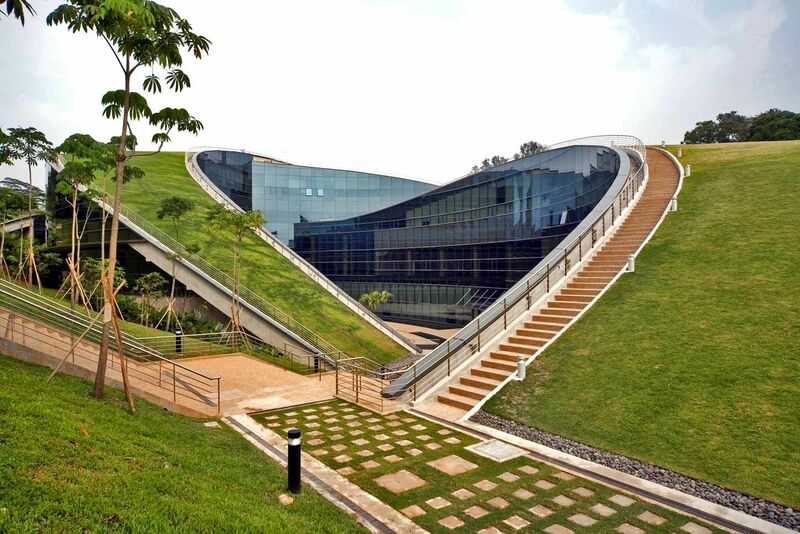 "The four-storey building, with its eye-catching sloped 'grass roofs', was designed to blend in with NTU garden campus setting. Beyond being an aesthetic feature that doubles as a scenic outdoor communal space, the green roofs keep the ambient temperature low and reduce heat in the daytime. In addition, the reflective pond in the central courtyard provides a cool visual respite for those gazing out of the classrooms, laboratories and offices that overlook it. "The eco-friendly building houses some of the most advanced media facilities, including a variety of digital laboratories and photography, film, animation and media studios. The School also boasts a comprehensive fine arts library, two art galleries and an auditorium that can seat up to 445 people," (NTU Press Release, 2011). "The glass facade of the building allows full exterior views, again providing visual connectivity with the surrounding lush landscape. Lights are incorporated onto the roof to allow students to meet in the evening. At night, the building glows like a lantern, allowing activities of the school to be observed from the outside. The changing character of the fa蓷de lends dynamism, life and interest to the building as day transforms into night," (CPG Consultants). The roof turf consists of a combination of two grasses, Zoysia matrella and Ophiopogon. 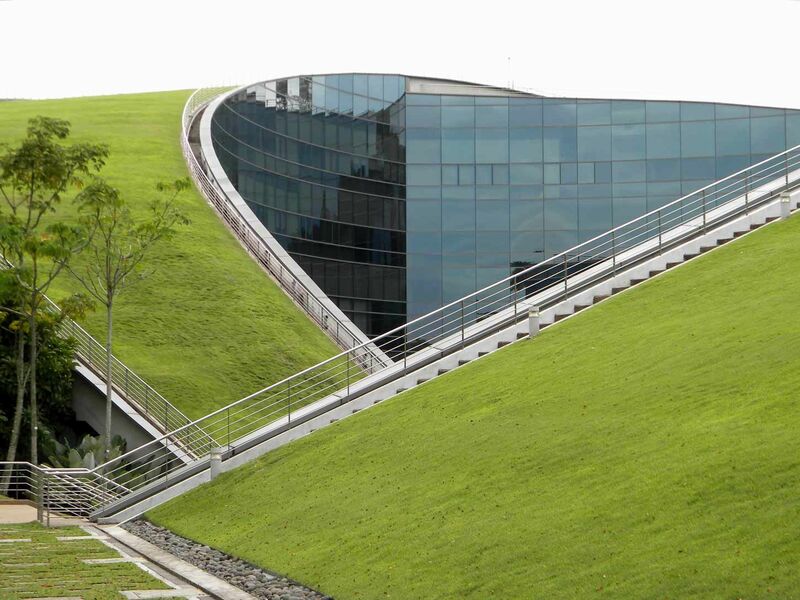 The curving roofs are accessible by stairs along the edges, although only one of the six portions of green roof is best for seating due to lower slopes. Under the grass roof are four layers of interrelated matter which include crushed volcanic rocks, pumice and washed sand (for the grass to root), as well as a moisture retention mat. The turfgrass remains green and healthy year round via an automatic sprinkler system using harvested rainwater. 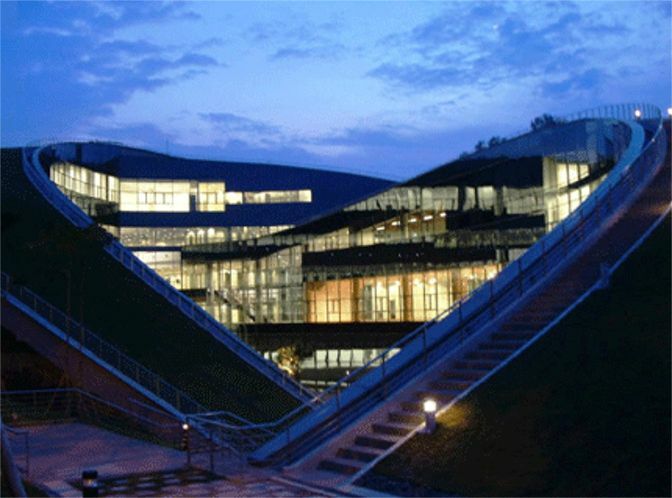 "This 5 story facility sweeps a wooded corner of the campus with an organic, vegetated form that blends landscape and structure, nature and high-tech and symbolizes the creativity it houses...The curving green roofs distinguish the building from among the other structures on campus but the line between landscape and building is blurred. The roofs serve as informal gathering spaces challenging linear ideas and stirring perception. The roofs create open space, insulate the building, cool the surrounding air and harvest rainwater for landscaping irrigation," (Inhabitat, 2008). 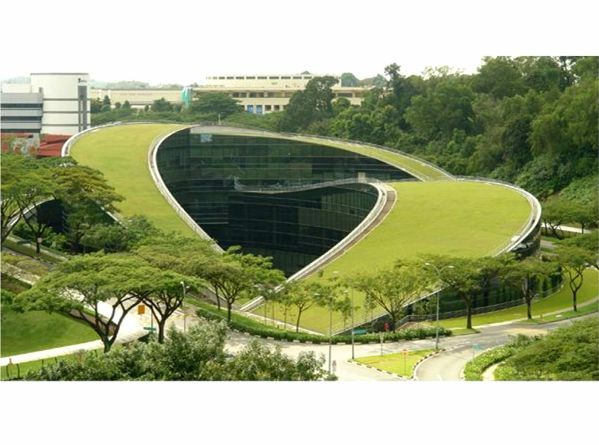 - Verdant turfed roof blends into the lush greenery and environment. - Turfed landscape as scenic outdoor communal space. - Green roof lowers both the roof temperature and ambient temperature hence reduce heat gain to the air conditioned building. - The building is oriented with its facades facing north and south to minimize solar gain. - High efficiency discharge lights are adopted throughout the building. - The rain water collection system is fitted on the green roof for irrigation. - The rain sensors are installed on the green roof to automate the irrigation process whereby irrigation is ceased when it rains. - The curved building is embracing a courtyard with water features and plants. The reflection of the trees and nature can been seen on the all-glass exterior. 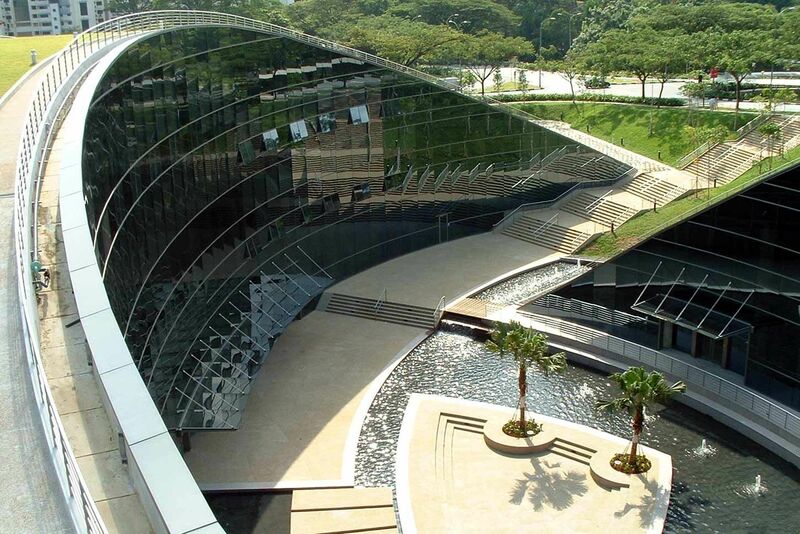 Nanyang Technological University received the Green Mark Platinum Award from the Singapore Building and Construction Authority (BCA) for adopting best practices in environmental sustainability in May, 2011. 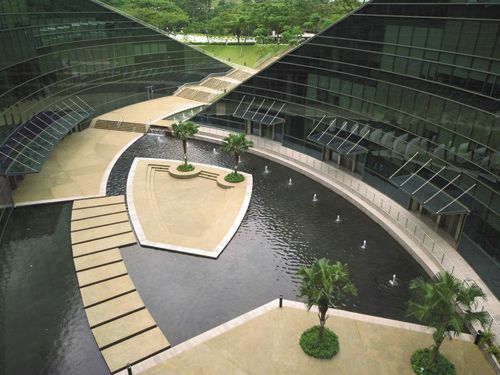 The major areas of achievement for the ADM building were its energy savings of almost 120,000 kWh per year (enough to power 27 4-room HDB flats a year) and more than 1,170 cubic metres of water saved per annum (equivalent to the average water consumption of 5 4-room HDB flats a year), leading to lower operation and maintenance costs. 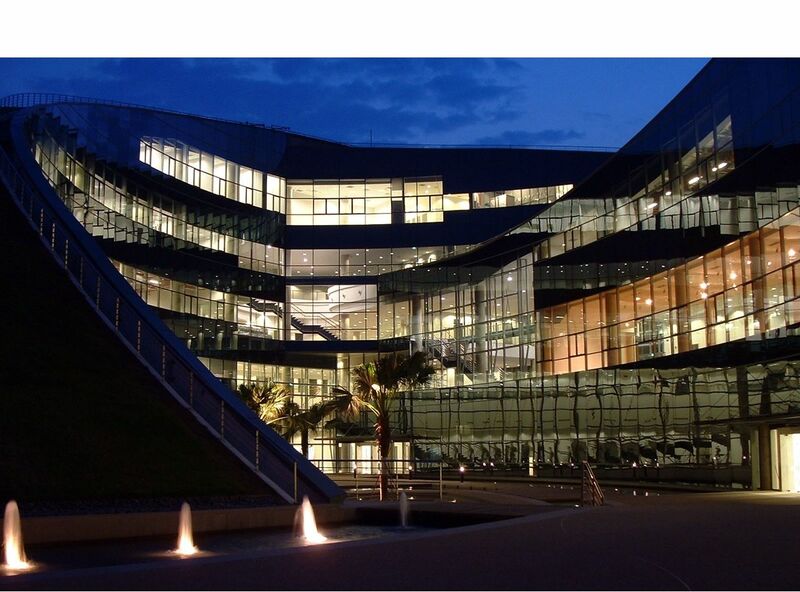 The savings are due to the building energy and water efficient features which include its high-efficient lights with motion and photo-cell sensors, retrofitted air-conditioning system as well as rainwater collection with rain sensors and irrigation system. The green roof and high performance glass as well as the use of carbon dioxide sensors in its air-handling units help to reduce energy used and maintain a healthy indoor air quality. In addition, the reflective pond in the central courtyard provides a cool visual respite for those gazing out of the classrooms, laboratories and offices that overlook it.